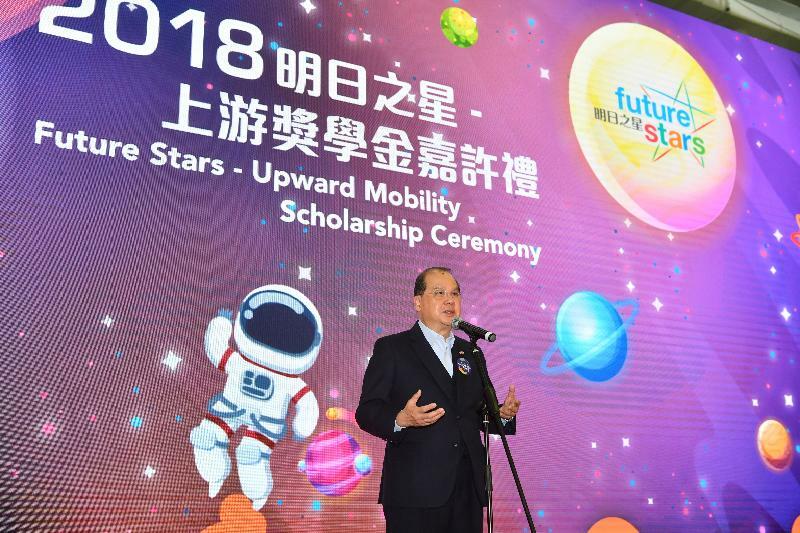 The Chief Secretary for Administration and Chairperson of the Commission on Poverty (CoP), Mr Matthew Cheung Kin-chung, officiated at the Future Stars - Upward Mobility Scholarship Ceremony today (January 26), encouraging youngsters to embrace opportunities and rise to life’s challenges with perseverance, positivity and enthusiasm. 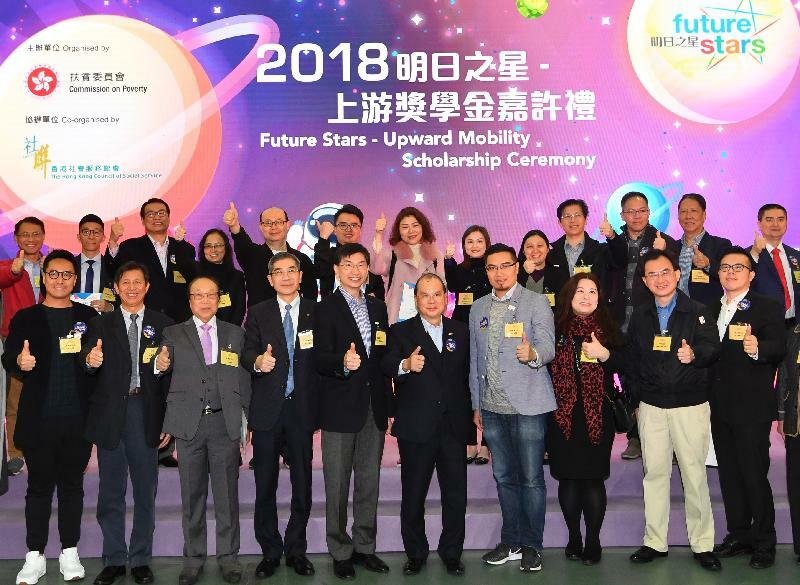 The Future Stars – Upward Mobility Scholarship scheme was implemented by the CoP in 2014 to encourage less privileged students from secondary schools, special schools and institutions of Vocational Training Council who have demonstrated resilience and a positive attitude in the face of adversity. Funded by donations from all sectors of the community, scholarships of $5,000 provide assistance to better equip them in moving up the social ladder. Mr Cheung said that the scholarship scheme has been widely supported by donors from all walks of the community, and schools have actively participated. Each year around 100 donors have contributed towards the scholarship, and over 450 secondary schools (about 85 per cent of all secondary schools) have nominated students for the scholarship. Over the past five years over $28.6 million has been raised to benefit 5 454 students. In 2018, the scheme raised approximately $4.9 million from all parts of the community, benefitting 933 students from 451 secondary schools. At today’s ceremony Mr Cheung presented certificates of appreciation to donors and thanked the Hong Kong Council of Social Service, schools and social welfare organisations for supporting the scheme. In addition, Mr Cheung said that the Government recognises that young people have very different talents and aspirations, and strives to help them realise their potential and become future pillars of society with vision, leadership and commitment. With this aim in mind, internship and exchange programmes have been launched in the Mainland and overseas, as well as the Youth Development Fund and the Space Sharing Scheme for Youth in Hong Kong. Mr Cheung added that in view of the positive feedback on the “Be a Government Official for a Day” programme implemented by the CoP in 2018, the scale of the programme would be expanded this year to include the Chief Executive, principal officials and other senior government officials. He encouraged students to participate in the programme. About 800 guests attended today’s ceremony including student awardees, donors (mainly from the business and professional sectors) and representatives from participating schools. Student awardees shared their stories and thoughts about the scholarships, with some also performing at the ceremony. Information on the Future Stars – Upward Mobility Scholarship can be obtained from the website of the CoP at www.povertyrelief.gov.hk.